Contemporary…Sleek…Quality! 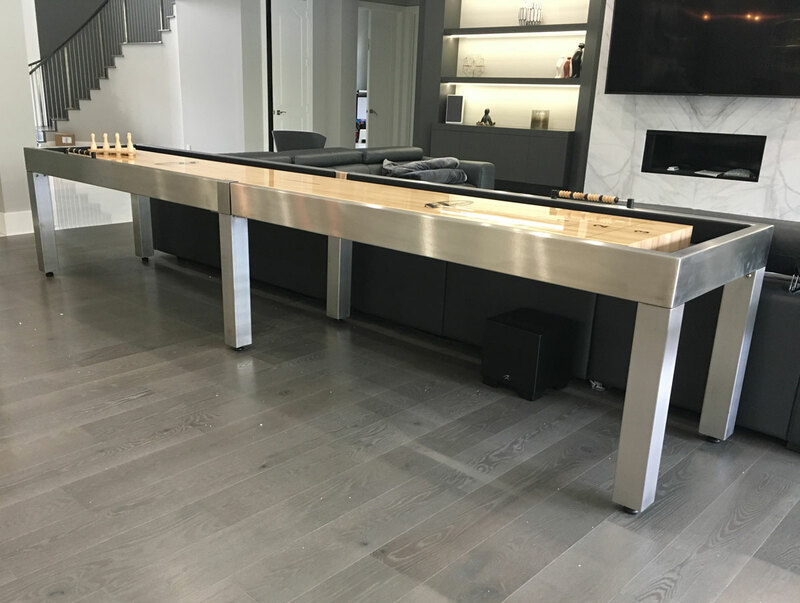 New from Hudson Shuffleboards, the Brushed Stainless Steel Shuffleboard is a sleek and contemporary design that brings shuffleboard into the new era. 9 foot shuffleboards are the shortest, but don’t think that being short will lessen its appeal! 9’ shuffleboards fit better in smaller rooms, are the most affordable, and provide faster play than their longer counterparts. This table is made to order and fabricated 100% in the USA out of Solid Brushed Stainless Steel (no veneers). To add a clean touch, the inside walls of the cradle are lined with a vinyl wrapped cushion, which can also be upgraded to genuine leather. For a final touch, you can also add a solid wood top rail with your choice of stain color.